These Chunky Monkey Energy Bars taste just like the ice cream with banana, cacao and walnuts but they are so much healthier. They give you just that little bit of extra energy when you need it and make a great pre-exercise snack. My freezer is filled with these kind of easy snacks. I make large batches in advance so I always have an energy bar ready when I need one. They are a great snack in between my yoga classes. I also love eating them as a pre-workout snack before my interval or endurance training. These Chunky Monkey Energy Bars are also easily digestible but high in nutrients that can help fuel your performance. The cacoa gives you a little bit of a caffeine boost, which can help boost your performance. The glucose in dates gives you quick and easy fuel and the sucrose in bananas gives you prolonged fuel for your workout. 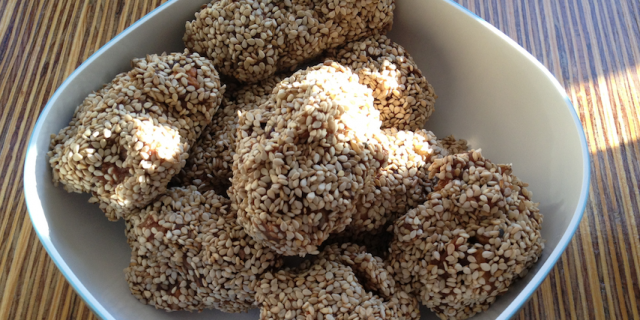 They are healthier than any energy bar you can buy in stores and they also very easy to make. The only thing you need is a food processor. I like to roll them into little balls and cover them with sesame seeds or coconut flakes. Add the dates and coconut oil to a food processor and blend until smooth. In a small bowl mix the other ingredients, except for the sesame seeds. Add the date and coconut mixture into the dry bowl and mix well. Add sesame seeds to a separate bowl. Make small balls of the mixture (the balls should still be a little soft) and roll them through the sesame seeds until covered on all sides. Place balls in a container and freeze until solid. They will still stay slightly soft though.